Whether you’re a fan of puzzle games or you simply enjoy playing them to pass time, it’s always nice to find a good game that’s both challenging and relaxing to play. 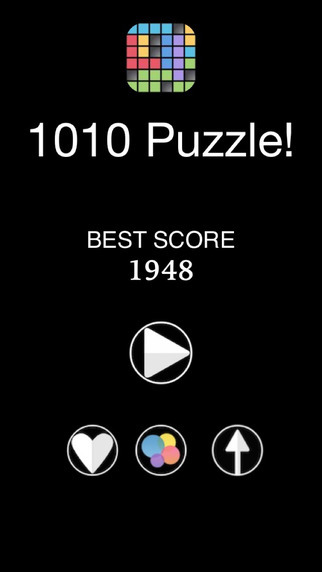 1010 Puzzle is an iOS game by Miguel Garulo that will test your spacial awareness skills. 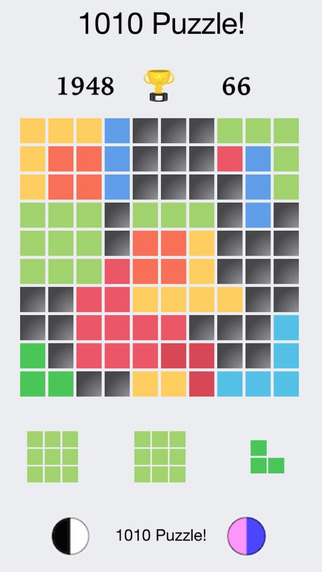 In order to play 1010 Puzzle you have to place puzzle pieces of various shapes and sizes on the grid by tapping and dragging them. 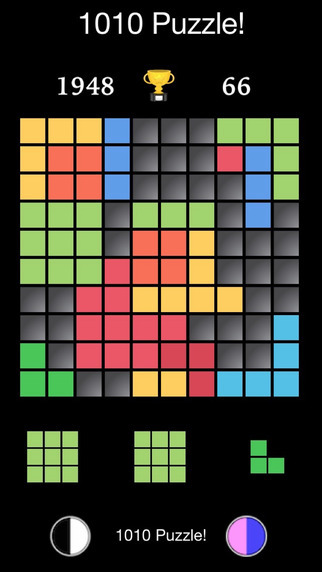 The game is a bit like Tetris in that the shapes are similar but the game mechanics are much more controllable. The goal of 1010 Puzzle is to keep placing shapes on the board in order to create solid lines. Once you create a solid line it disappears and points are added to your score. The game is over when you have run out of room and can’t place anymore shapes on the board. You’ve might’ve played the predecessor to 1010 Puzzle, 1010!, and if this is the case you might be wondering what makes the two games different. The main difference between the two game is that the original requires you to place all three shapes on the board before renewal in new shapes, while 1010 Puzzle immediately replaces a placed shape. Also, 1010 Puzzle features multipliers that encourage you to destroy the most rows at once. Doing this multiplies your score a great deal depending on the number of rows you remove at the same time, and it’s a great way to increase your score significantly. What this means is that 1010 Puzzle rounds are a bit longer than the original game and you have a better chance of getting a high score if you play strategically. The one downside to this is that rounds tend to go on forever and the game is a bit less challenging, but it’s great for casual players who are looking for a relaxing game to play. I do want to mention that 1010 Puzzle is supported by ads that do show on the game screen, but I didn’t really notice them while playing and they don’t get in the way of actual gameplay. The game also features Game Center integration so you can compete against your friends for the highest score. I’ve always been a huge fan of this system because it encourages players to constantly improve their score for bragging rights. Overall, 1010 Puzzle is a great game for iPhone and iPad that’s a bit challenging but also very relaxing. It’s definitely something you can play for hours on end even if it’s just to try and best your previous high score. I highly recommend checking it out even if you’ve played the original. 1010 Puzzle! requires iOS 7.0 or later and is compatible with iPhone, iPad, and iPod touch. This app is optimized for iPhone 5, iPhone 6, and iPhone 6 Plus.